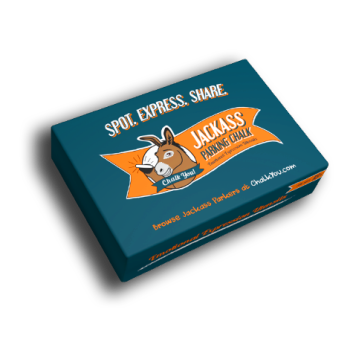 Emotional Expression Utensils that can be used to convey feelings of dislike, frustration and/or disbelief in attempts to rid the planet of Jackass Parkers. Side effects include, but are not limited to; viral photos, feelings of self fulfillment and the slight possibility of small crowds pointing and laughing. 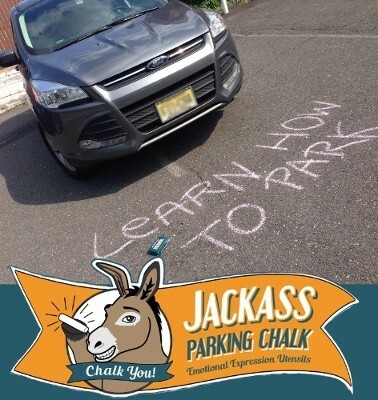 Keep your chalk on your persons or in your car’s glove department. During your travels, keep a watchful eye out Jackasses. You’ll be surprised at how many are out there! 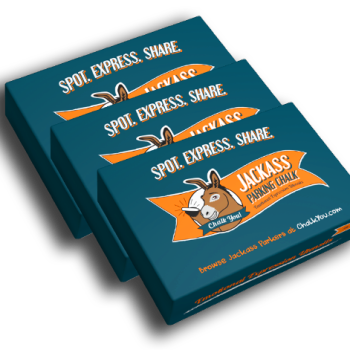 After you have spotted a Jackass, think about how they make you feel. Reach deep inside and harness your emotion, then reach for your Emotional Expression Utensils. 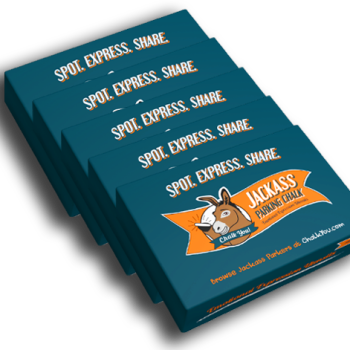 Do your part in ridding the world of Jackass Parkers by blasting them virally on the interwebz. Let the Jackass know he’s been blasted by leaving a tracking number ticket.